Sustained long-term economic growth comes from increases in worker productivity, which essentially means how well we do things. In other words, how efficiently does a nation use its workers and other resources? Labor productivity is the output that each employed person creates per unit of his or her time. The easiest way to understand labor productivity is to imagine a Canadian worker who can make 10 loaves of bread in an hour versus a U.S. worker who in the same hour can make only two loaves of bread. In this fictional example, the Canadians are more productive. Being more productive essentially means you can do more in the same amount of time. This in turn frees up resources to be used elsewhere. What determines how productive workers are? The answer is pretty intuitive. The main determinants of labor productivity are physical capital, human capital, and technological change. These can also be viewed as key components of economic growth. Physical capital can be thought of as the tools workers have to work with. More formally, physical capital includes the plant and equipment used by firms but also infrastructure, things like roads and other components of transportation networks that contribute to the economy. Infrastructure is provided by governments. Again, greater physical capital implies more output. Physical capital can affect productivity in two ways: (1) an increase in the quantity of physical capital (for example, more computers of the same quality); and (2) an increase in the quality of physical capital (same number of computers but the computers are faster, and so on). Human capital is the accumulated knowledge (from education and experience), skills, and expertise that the average worker in an economy possesses. Typically the higher the average level of education in an economy, the higher the accumulated human capital and the higher the labor productivity. Human capital and physical capital accumulation are similar: in both cases, investment now pays off in longer-term productivity in the future. Another factor that determines labor productivity is technology. Technological change is a combination of invention—advances in knowledge—and innovation, which is putting that advance to use in a new product or service. For example, the transistor was invented in 1947. It allowed us to miniaturize the footprint of electronic devices and use less power than the tube technology that came before it. Innovations since then have produced smaller and better transistors that that are ubiquitous in products as varied as smart-phones, computers, and escalators. The development of the transistor has allowed workers to be anywhere with smaller devices. These devices can be used to communicate with other workers, measure product quality or do any other task in less time, improving worker productivity. When most people think of new technology, the invention of new products like the laser, the smartphone, or some new wonder drug come to mind. In food production, the development of more drought-resistant seeds is another example of technology. Technology, as economists use the term, however, includes still more. It includes new ways of organizing work, like the invention of the assembly line, new methods for ensuring better quality of output in factories, and innovative institutions that facilitate the process of converting inputs into output. In short, technology comprises all the advances that make the existing machines and other inputs produce more, and at higher quality, as well as altogether new products. We can formalize these ideas by introducing the concept of the the aggregate production function. A production function is the process of turning economic inputs like labor, machinery, and raw materials into outputs like goods and services used by consumers. A microeconomic production function describes the relation between the inputs and outputs of a firm, or perhaps an industry. 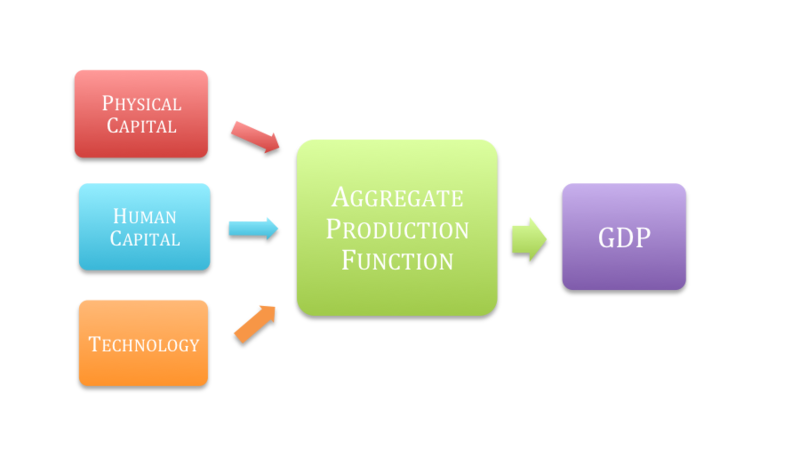 In macroeconomics, the aggregate production function is the relationship between all the inputs in the economy and GDP. Figure 1 shows an example of the aggregate production function. Figure 1. Aggregate Production Function. 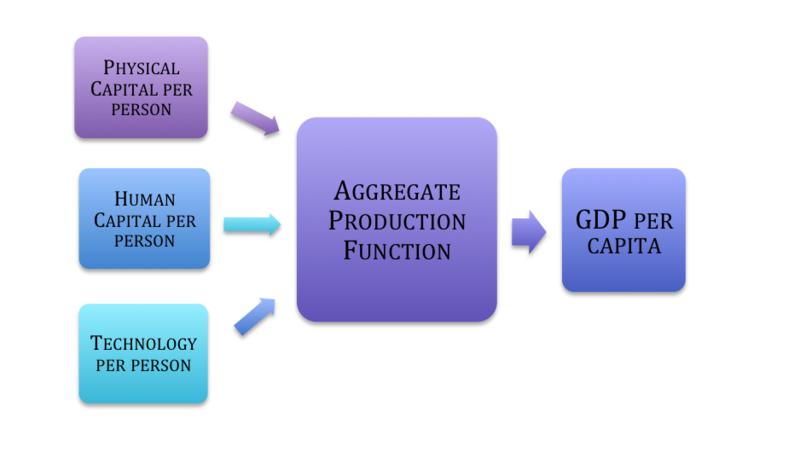 An aggregate production function shows what goes into producing the output for an overall economy. We are already familiar with the idea of an aggregate production function—it is the concept behind the production possibilities frontier. Remember, the PPF shows the maximum quantities of goods and services a nation can produce given the resources it has available. The aggregate production function determines those maximum quantities. Economic growth is illustrated by an increase in the production possibilities frontier, which we show in Figure 2, below. Figure 1. Economic growth pushes out the production possibility frontier. The inner PPF corresponds to the maximum GDP obtainable given the resources available in 2010. The outer PPF shows the maximum GDP obtainable given the resources available in 2010. 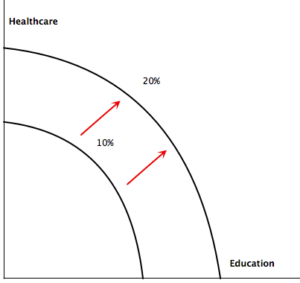 Economic growth is illustrated by the outward shift in the PPF. What causes economic growth then? It must be increases in physical or human capital, or technological improvements. We indicated that economists often use real GDP per capita as a proxy for the standard of living. We can examine how the standard of living improves over time by looking at the aggregate per capita production function, shown below in Figure 3. The aggregate per capita production function is very similar to the aggregate production function, except that all elements are divided by the population. The inputs are the average level of human capital per person, the average level of physical capital per person, and the level of technology per person. Increases in the quantities of physical capital, human capital and technology per person lead to a higher standard of living over time. Figure 3. Aggregate Per Capita Production Function.